Climate change is telling us to stop pitching pollution into the atmosphere--in much the same way that the bubonic plague taught our ancestors to stop dumping filth into the streets in the Middle Ages. We listened then, but not now. Governments continue paying industries huge bonuses to release carbon into the atmosphere by burning fuels from fossilized plants and--increasingly--live plants ("biomass"). According to the International Monetary Fund (IMF), global subsidies of fossil fuel use this year total an astronomical $5.3 trillion. The IMF estimates that eliminating subsidies would reduce global carbon dioxide emissions by 17 percent, reduce premature deaths from air pollution by 50 percent, and increase social welfare--from reduced environmental damage and higher revenue--by $1.8 trillion. Governments also heavily subsidize biopower, biofuels, and other bioenergy technologies. In this discussion, biomass energy, or "bioenergy," refers to the use of energy primarily generated from plants and plant-derived materials. "Biopower" refers to electricity generated from the burning of biomass. "Biofuel" refers to liquid fuel such as corn ethanol (the primary biofuel in the U.S.) and biodiesel made from algae, animal fat, grasses, municipal solid waste, sugars, palm oil, vegetable oil, and wood. This article excludes other types of bioenergy--such as methane collected from landfills and wood burned for heat--and focuses on biopower fueled by wood and ethanol made from corn. Governments justify subsidies for bioenergy by flawed carbon accounting policies and a myth that bioenergy is "carbon neutral." This myth asserts that the regrowth of plants recaptures the carbon released from bioenergy, thereby preventing carbon from accumulating in the atmosphere. However, regrowth of plants can never be guaranteed, and even if regrowth occurs, it takes too long for bioenergy to be carbon neutral. Regrowth typically takes several months for agricultural crops and to up to 450 years for wood. Though the carbon-neutrality myth has been disproven--for example, by the Manomet Center for Conservation Sciences--it persists tenaciously in government policies, even in President Obama's otherwise beneficial Clean Power Plan. The stakes are high. According to the U.S. Environmental Protection Agency, "forestry, agriculture, and other land use" is the second-largest source of greenhouse gas (GHG) emissions, accounting for 24 percent of the total worldwide. This is just slightly less than the largest source, "electricity and heat production," and much more than "transportation." Furthermore, when we cut down forests to feed greedy biopower plants, we remove natural "scrubbers" from our environment. Ecosystems remove significant amounts of carbon dioxide from the atmosphere and store the carbon in plants, dead organic matter, and soils. For example, U.S. forests store 12 percent of U.S. GHG emissions each year. Biopower destroys carbon storage capacity by killing plants and disrupting soils. Biopower harms the climate more than coal, releasing 1.5 times as much carbon dioxide per unit of electricity generated. It thus delivers a "double whammy" to the climate. Biofuels perform no better. For example, it takes more than a gallon of petroleum to produce a gallon of ethanol. Furthermore, a gallon of ethanol contains less energy than a gallon of petroleum. The Environmental Working Group estimates that last year's U.S. production and use of corn ethanol resulted in 27 million tons more carbon emissions than if Americans had used straight gasoline in their vehicles. Biopower proponents often claim that they use only waste wood for fuel; however, biopower plants' voracious appetite for fuel invariably requires that they also burn whole trees. In 2009, five biopower plants were envisioned for Massachusetts. Animations created using the state's and project proponents' own data show that to fuel these facilities, the state's forests would have been logged in only 9 to 16 years. The cheapest way to procure wood is by clear-cutting forests, which is standard practice. 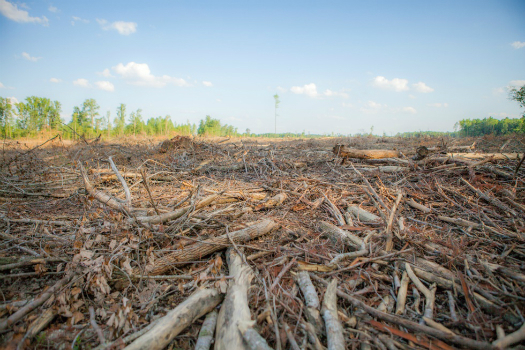 Biopower devastates forests and the ecosystem services they provide. The Earth has already lost half its trees since human civilization began. Europe has exhausted its own forests, so forests in the southeastern U.S. are now being clear-cut and made into pellets that are shipped (using oil) across the Atlantic Ocean to supply wood fuel to biopower plants in Europe. Similarly, corn for ethanol production is not renewable, says Cornell University agricultural scientist David Pimentel. "Corn production in the U.S. erodes soil about 12 times faster than the soil can be reformed, and irrigating corn mines groundwater 25 percent faster than the natural recharge rate of groundwater. The environmental system in which corn is being produced is being rapidly degraded." In the U.S., corn production uses more land than any other crop, equal to an area about the size of California, and 40 percent of the corn crop is used to produce ethanol. Fertilizer use for corn is massive, and much of the chemicals wash into lakes, rivers, and coastal oceans, polluting waters and damaging ecosystems along the way--such as the "dead zone" in the Gulf of Mexico, an area the size of New Jersey that is devoid of animal life. Pesticides and herbicides used in corn production kill wildlife and contaminate surface water, groundwater, and air. Ethanol also diverts corn from the food supply--driving up food costs worldwide. Yet government policies so richly reward ethanol production that huge areas of grassland and prairie have been recently converted to corn production, damaging waterways, wetlands, and wildlife. Partly owing to their inefficiency, biopower plants require gigantic infusions of cash in order to be financially viable. They receive taxpayer and ratepayer subsidies in the form of Renewable Energy Credits, investment and production tax credits, and loan guarantees, which cost the public billions of dollars on top of payments for the electricity itself. In addition, nearly every country subsidizes the timber industry--which provides the fuel--through similar giveaways. Ethanol contains about 76,000 British Thermal Units (BTUs) per gallon, whereas gasoline contains about 114,000 BTUs per gallon. Therefore, to get the same amount of energy contained in a gallon of gasoline, a motorist must buy about 1.5 gallons of ethanol. As a consequence, E10 (which contains 10 percent ethanol and 90 percent gasoline) yields fewer miles per gallon than pure gasoline. That mileage penalty is paid at the pump through the purchase of additional fuel. Furthermore, since 1982, the price per unit of energy from ethanol has been about 2.4 times that of gasoline. Between 2007 and 2014, U.S. motorists incurred roughly $10 billion annually in fuel costs over and above what they would have paid for straight gasoline. Think about that the next time you fill up your gas tank. On top of what we pay at the pump, we treat the powerful corn ethanol industry to a smorgasbord of other subsidies. Through federal tax credits, loan guarantees, grants, and other mechanisms, "billions of taxpayer dollars have been squandered on an industry that relentlessly seeks additional special interest carve-outs," says Ryan Alexander, president of Taxpayers for Common Sense, a federal budget watchdog organization. Citizens also pick up the tab for the damage caused by floods, droughts, tornadoes, hurricanes, and other severe weather events that are exacerbated by climate change. Government policies designed to help industry at the expense of people and the environment are wrecking the climate. Bioenergy is so inefficient and expensive that it cannot function without subsidies from you and me. Therefore, one way to significantly help the climate is to end corporate welfare for the fossil fuel, big agriculture, and timber industries. This would spur clean energy innovation and competition--because energy conservation and efficiency and solar and other non-combustion technologies would no longer be financially disadvantaged. It's time to say no to corporate welfare and yes to clean energy. To successfully address our self-inflicted climate crisis, we need to stop burning fossil fuels and biomass for energy and begin preserving and restoring plants and soils. Governments are not likely to end their misguided policies on their own. Citizens must insist on constructive policy changes, just as our ancestors had to learn to stop dumping their filth in the streets in the era of the bubonic plague. Ellen Moyer, Ph.D., P.E., is an independent consultant dedicated to remediating environmental problems and promoting sustainable practices to prevent new problems. You can connect with her on LinkedIn and Facebook or find more information or sign up for updates on her website.